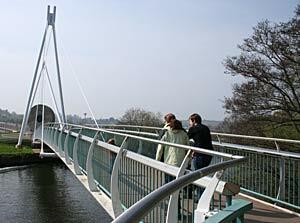 This foot and cycle bridge suffered delays as design problems during its building in 2002, attracted criticism from local councillors. Costing £700,000, it was designed to link Bonhay Road by the Mill on the Exe with Exwick Playing Fields, close to Flowerpot, and a few yards above Blackaller Weir. The two central sections were lifted into place using a 200-ton crane. The Bank Holiday weekend was chosen to reduce congestion. Bonhay Road was closed from 7pm on the 23 August, and reopened at 7am on the 27 August. It was formerly opened in November and now forms an important link across the river. Measuring 54 meters long, the bridge has two large 6 metre 'mill' stones to anchor the cabling supporting the structure. There is a second bridge over the flood channel to Flowerpot Fields. It is an attractive design that technically is a cable stayed bridge - the design of the concrete mill stones echo the many corn mills that lined the leats of Exeter in former times. The closest corn mill in former times to the bridge was the old Bonhay or Powhays Mill. 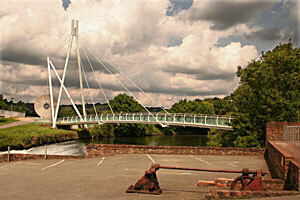 The structure was designed by Don Sharland and Clive Ryall, bridge engineers of Devon County Council. Land and Marine Structures Ltd were the main contractor to build the bridge, for South West Highways. It was named after a public competition run by the Express and Echo, and opened by David Jameson MP, Secretary of State for Transport on 21 November 2002. Millers Crossing from the Mill on the Exe.